For those of you who do not know what Fondue is, it is a delicious warm dish suitable for the cold winter days, and it originates from the Alps.Fondue’s fame experienced a peak in the 1970s and thereafter this delicious Swiss dish was forgotten. But now it seems that it returns with full force and is again modern, and thanks to it more and more people get to know the uniqueness of the alpine cuisine and its centuries-old culinary traditions. Fondueis a unique dish of humble origin that has won the status of a culinary masterpiece on the international stage and is part of the menus of the most famous restaurants around the world. Although it seems as a dish that is easy to prepare, in fact Fondue has a lot of variationsand a number of specifics in its preparation. In order to prepare anauthentic fondue, we certainly need culinary flair and carefully selected extra-quality products. Fondue with meat appeared for the first time at the table of alpine shepherds. In the past alpine shepherds brought with them pieces of cheesewhen they had to go to the mountain. They gathered around the fire when it was time for a break and a meal, so they melted the pieces of cheese on the fire. They consumed them using long wooden sticks with pieces of bread on them, which they dipped in the melted cheese. Later on, fondue acquired a more sophisticated form, so it was served in special pots similar to the shepherd’s metal pots, and it was consumed with long forks with wooden sticks, instead of with ordinary sticks. Fondue is a great winter dish that gathers everyone at the table. What is Fondue with meat? 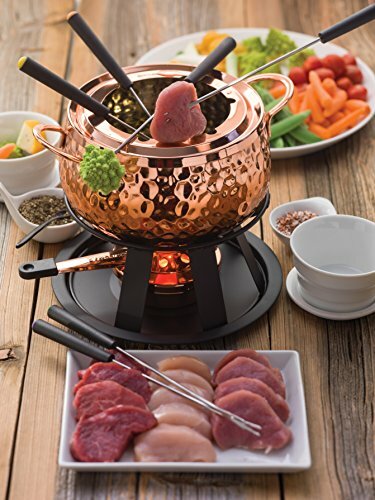 For those of you who don’t know, the delicious Swiss dish Fondue can be prepared not only with chocolate, but also with different kinds of meat and seafood. The literal translation of the name of this alpine specialty is “melted“, as its name is given by the French. 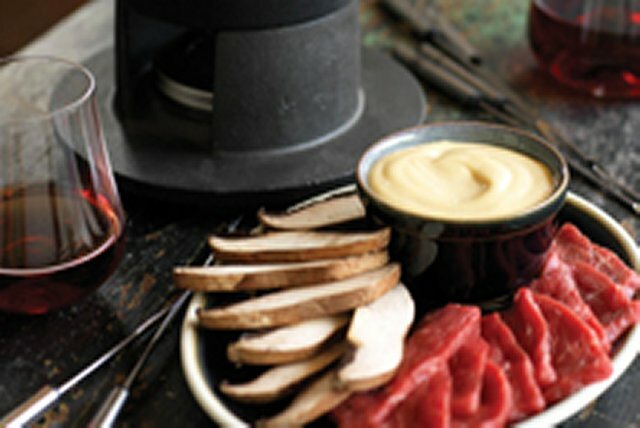 Preparation of fondue with meat, however, is not always an easy task, you need a culinary flair to create a great dish. For the preparation of a delicious fondue with meat first of all we need quality products. 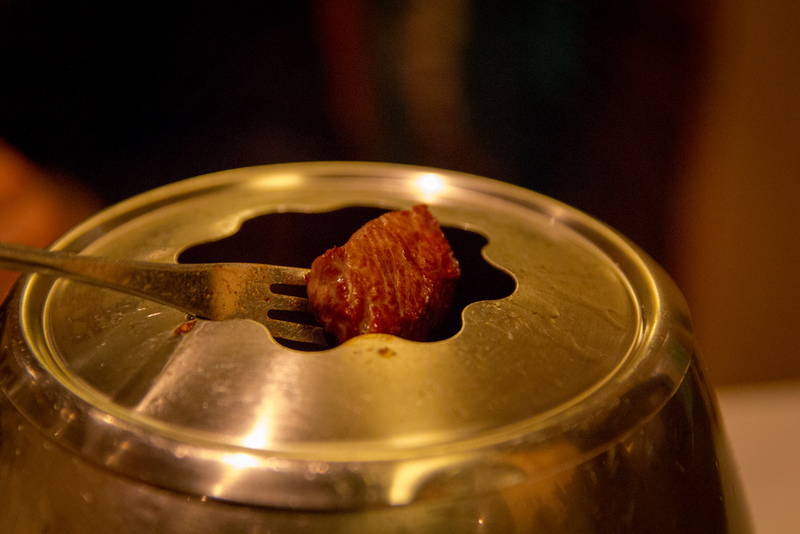 The meat fondue is made is a special potcalled caquelon, and it is placed on a special small spirit lamp. It is positioned in the center of the table. Then plant oil is poured in the caquelon and in it we dip pieces of meat, mushrooms and vegetables on long metal forks, until they are cooked to the desired grade. 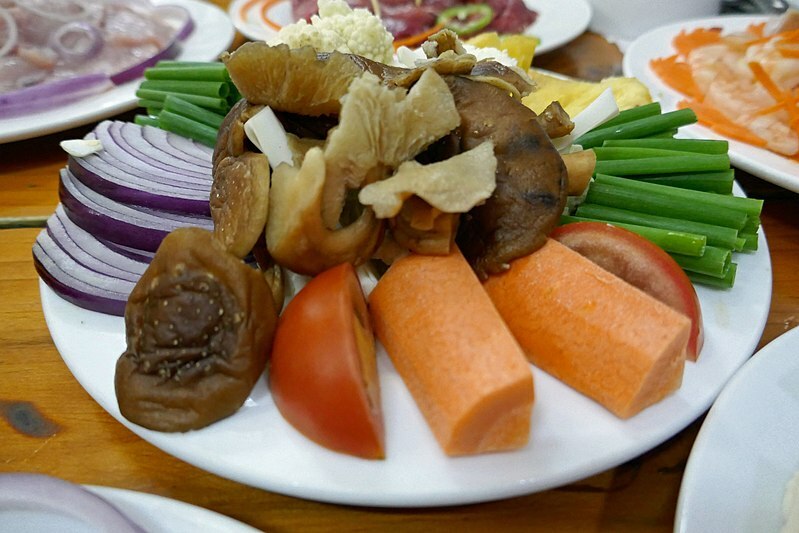 In addition to white chicken meat, you can also useveal, pork, tender beef fillet or steak, and fresh anchovy fillet.The process of frying is relatively fast. 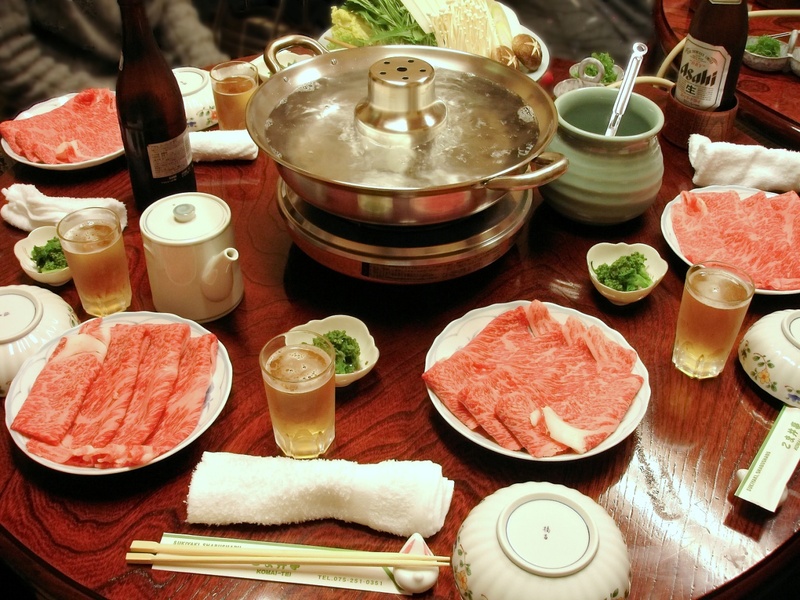 Different types of oils can be used to prepare a meat fondue. The classicFrench baguette, cut into small pieces or slices is one of the most commonly used ingredients for meat fondue or cheese fondue. But what would be a mead fondue without other ingredients. To the already prepared fondue bites, different garnishes are added such as fresh and canned vegetables, various sauces, dippers, various spices. The vegetable ingredients include slightly blanched cauliflower, broccoli, crispy gherkins, cooked potatoes or steamed potatoes. They can be consumed also with slices of ham or salami. 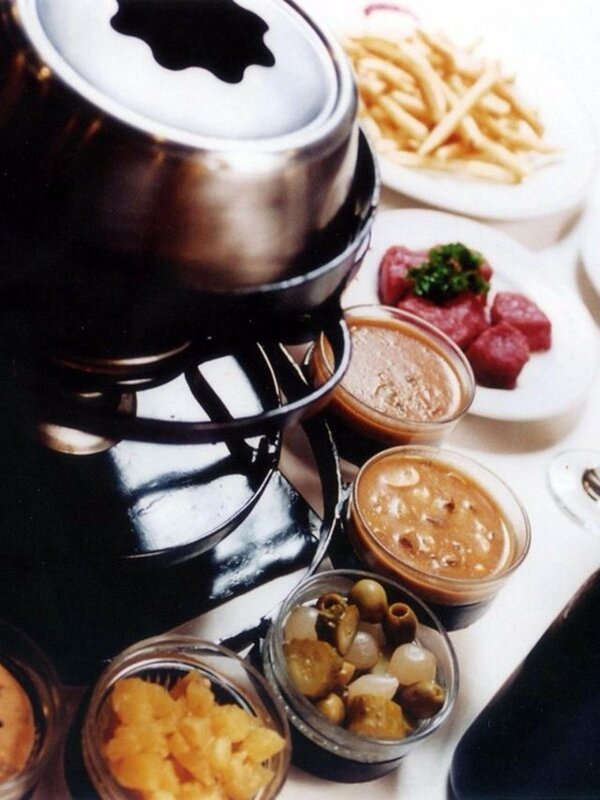 A beef fondue can be served also with fried potatoes in its modern version. Fondue can also be served with fresh salad of asparagus, spinach or kale on steam.Prior to serving the fondue, two types of breadare served in small cubes – rye bread and white bread. Cut the meat into thin strips of 5 mm each and season it with dry thyme and black pepper, then place it in a bowl. Then smother in oil the finely chopped onion and add the wine and the chicken broth. Pour this mixture in a Fondue pot and maintain it constantly at a high temperature. Stick each piece of meat on a long fork and fry it in the hot mixture. We have to mix well all the ingredients. Cut the onions and mushrooms and lightly smother them with cream and milk, then add the starch. Stir well. Cook the mixture for 5 more minutes. Season the cream according to your preferences with red hot pepper and salt to taste. The result is a great combination of cheese, chicken and mushrooms. If we don‘t have the right pot to serve Fondue in, then we can use a casserole with longer handle. The spirit lamp is a must. We can use also special bowl for serving salads, spices and sauces. They are most often made of ceramics, but they also can be replaced with small plates. You will need a cloth to handle the hot forks. It is very important the meat products that we use to be of high-quality and tender, the cheese to be original, if possible, in order to melt well. Cut the meat into thin strips of 5 mm each and season it with dry thyme and black pepper. Then smother the finely chopped onionin oil and add the wine and the chicken broth. Place the mixture in a Fondue pot, keep it hot. Each piece of meat is forkеd and fried in the hot mixture. The chopped onions and mushrooms and lightly smothered with cream and milk, then the starch is added. Stir well. Season the cream according to your preferences, you can use red hot pepper and salt to taste.